There will be something for everyone and for all ages. Don't miss it! The 942nd Anniversary of the Battle of Hastings. We bring you a festival of Hastings TODAY. Every effort had been made to produce correct information, dates and times at the time of going to press. However, unforeseen circumstances may occur which are beyond our control. Updates will be published on the site prior to the week but the Hastings Week Committee cannot be held for such changes which are in the hand of individuals and groups/Associations. Interested in local history? Visit the Hastings History House and see how you could get involved. Exhibitions by Old Hastings Preservation Society, Hastings Local History Group and Hastings Area Archaeological Research Group. Re-opened last year after a major refurbishment supported by the Heritage Lottery Fund. New 20th century Hastings history galleries including features on John Logie Baird, Robert Tressell, Mods and Rockers and seaside entertainment. Also new displays on Grey Owl and Native America, Sussex Pottery, paintings including J.M.W. Turner's Fishmarket at Hastings, dinosaurs and local wildlife. The adjoining Durbar Hall was built as part of an Indian palace for the Indian and Colonial exhibition of 1886 and contains material from India, the Far East and Australasia collected by the Brassey family in the 1870s and 1880s. Wheelchair access, parking and refreshment area. Saturday and Sunday, 11am - 4pm. High Street provides an introduction to the history of the Old Town of Hastings and is arranged as a walk back in time from the 20th century to Prehistory. The building is fully accessible, and contains a wealth of historic exhibits, interactive models and reconstructions. The only museum of its kind in Britain with fine exhibits from far back in time. "Hands on the Past Workshops" held on various days throughout Hastings Week. Old Hastings Pottery, 3 Courthouse Street, Hastings Old Town. Make yourself a small pot with professional guidance - to take home with you for £2.50. Firing and glazing available. Those Who Serve Us' themed displays will be up throughout the week. Pam Brown OBE will present the 'Pam Brown OBE' Trophy to the winner, and the Mayor will present the 'Ray Goode Memorial Trophy' to second place at a reception later in the year. Contact Ian Porter on 01424 812662. Keep your children busy looking around the Museum to find the answers. No cost but a small donation would be welcomed. Entry Free. Donations to Fishermen's Museum welcome. Call 01424 461446. Have an interesting tour around the Stade to find the answers. No cost but a small donation would be welcome. Available during Museum opening hours: 10am to 5pm. Call 01424 461446. Hastings History House, 21 Courthouse Street, Old Town. Admission Free. Light refreshments available. Donations to Hastings History House welcome. Demonstration of hoisting the sails of the Rebecca May (the oldest fishing boat on Hastings fishing beach). Exhibition continues until 11th January 2009. Admission Free. Sunday 12th until Sunday 19th, 10am to 5pm daily. Watercolour & Mixed Media Paintings. Free admission. Call 01424 715837. Stalls selling Homemade Preserves, Cakes and Flowers. Early arrival recommended, as they sell out very quickly. True Tales of Terror from the town's less illustrious past revealed in grim detail. Guided walk, definitely not for the squeamish! Admission: £5.50 (adults), £4.00 (under age 16), payable on the evening. Duration 90 minutes. Participants with dogs on leads welcome. The 1066 Jazz Club opens Hastings Week with the Big Bear Stompers with international jazz vocalist Judy Eames. This will be an enjoyable evening of traditional jazz in the San Francisco revival style. Hastings Corps of Drums, a 1066 piper and pre-service units of the town parade from Woolworths to the Town Hall. A colourful scene of Standard Bearers, services and youth groups. The Town Crier introduces the Mayor who formally opens the week of festivities. A small party then proceed to Hastings Castle to raise the Gonfalon, the flag of William the Conqueror. With special guest visit from BBC Radio 2 DJ Alex Lester. Supported by St Leonards Motors and Hastings Borough Council. Continuing Monday to Saturday 10am to 5pm, Sunday 11am to 4pm. Admission Free. Two day sale of secondhand jewellery in aid of Hastings Lifeboat. Painting portrait of Jon Bartholomew, Hastings Town Crier. Juliette will give a commentary to spectators whilst she works. Free Entry. choice of homemade soup with a roll for £2 - drinks also available. Organised by 2nd Hastings ( Old Town ) Guides. Call 01424 850793. Talent Show and Open Day with performance, art exhibition and video presentation. Exotic displays by the Iceni Belly Dancing Troupe and the Tapping, Sand Dancing Egyptian Mummies. The first of a series of 6 Winter Talks. The Story of Queens Road . Illustrated Talk by Ken Brookes. £1 entry, light refreshments available. Spine Chilling close encounters of the supernatural kind vividly described with thought-provoking insights of the elusive spirit world. Admission: £5.50 (adults), £4 (under 16s), payable on the evening. Duration 90 minutes. Participants with dogs on leads welcome. Call Malcolm on 07964 793550. Sussex Concert Orchestra with conductor Kenneth Roberts present 'Holst - The Planets'. Proms style finale with Karen McInally. Tickets £10 (£8 concession) available in advance from Hastings Information Centre, Priory Meadow. Joint tickets for Hastings Week Proms & Opera in the Castle £16 (£12 concessions) available from Hastings Information Centre until 30th September. With support from St Leonards Motors and Hastings Borough Council. See over 600 children from outside clubs competing with Hastings teams. Games start at 10.30am with presentations at 2.30pm. Discover the obscured and the obscure in this informative exploration of an intriguing labyrinth of ancient alleys and byways. Route includes stairs and some steep slopes. Duration approx 1hr. 40 mins. Admission: £5.50 (adults) £4 (under 16s) payable on the day. Participants with dogs on leads welcome. A guided walk of the Stade area looking at the many fascinating old buildings, boats and nautical artefacts. Led by local historian, Steve Peak . Donation £2. Winkle Island , Rock-a-Nore, Old Town . Led by Caroline Kempster. Refreshments available at Barbeque site. Please wear suitable footwear. Call 01424 420117. Illustrated talk by Heather Grief. £1 entry, light refreshments available. Call 01424 424744. The Harvest Festival of the Sea will be held at the Fishermen's Museum (formerly Fishermen's Church) on the deck of the Lugger " Enterprise ". All are welcome. Take this rare opportunity to discover local hauntings and other strange aspects of St Leonards heritage... if you dare!! Admission: £5.50 (adults), £4 (under16s), payable on the evening. Participants with dogs on leads welcome. Contact: Malcolm on 07964 793550.
with Radio Nostalgia (Wartime & Fifties). Entry: 50p including coffee/tea & biscuits. Illustrated Talk by George Greaves - well-known local photographer. Free Entry, but donations to Museum welcome. Talk by Dr. Ke Xia Xu with a questions and answer session. Find out all about Chinese Medicine & Remedies. Talk lasts one hour. Free Entry. An Old Town based Bingo Game, originated and organised by Bruce Nicol and great fun to play. Entry £4 incl. light refreshments, with cash prizes for winners. Proceeds to Hastings History House. Conductor Kenneth Roberts with guest soloists. Tickets £8 (£6 concession) available in advance from Hastings Information Centre, Priory Meadow. Display of cardigans designed and knitted for the Clements Creativity Cup 2008 showing the imagination flair and skill club members incorporate in their knitting. Come and try your skills on the knitting machine. Derek will be signing his book 'Drawn to Hastings '. Entry (including Coffee & Refreshments) £1.50. Tel: 01424 446776. £3, to include Coffee and Cakes. Proceeds to Stroke Association. All are welcome. Full Guided Tour. Adults: £3, Under 16s: £2. A Video Presentation. Free entry, Donation appreciated. Wine and Cheese will be available between 1pm and 2.30pm for a small charge. History House open today between 11am and 6pm. Tel: 01424 424744. A selection of Dolls Houses and Shops to view with a variety of miniature hand-made food and dressed furniture, all made by Amanda and Jean Hope £2.50 entry to include tea or coffee and biscuits. Donations to Old Hastings Preservation Soc. and Macmillan Nurses. All works by Amanda & Jean Hope. Photographic display and presentation of winning entries incorporated with the award ceremony to this years green fingered residents and businesses. 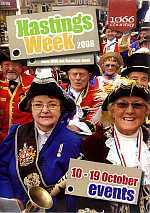 Presented by The Mayor, Cllr Maureen Charlesworth and Hastings Borough Council. Hastings Borough Council, Hastings Observer and local business sponsors work together to present awards to local achievers for their outstanding work within the Community. Followed by the 'Award of 1066', the supreme accolade for services to the town, presented by The Mayor, Cllr Maureen Charlesworth. For Tickets and further information please look in Hastings Observer. On the night of the Full Moon followed by Ghost Watch and for signs of UFOs. Public welcome to watch ceremony. No charge, but donations welcome. Contact: Kevin Carlyon on 01424 444201. Courtesy of Margaret & David Ivatts. Coffee and Home Baked goodies with a warm welcome and plenty of chat! Viewing of garden designed as built by present owners with different bricks and paving that give an interesting effect. Features include attractive gazebo and fountain. £3 entry fee. Proceeds to OHPS. Conducted Tours of the Lifeboat and Lifeboat Station. Lifeboat Station and Souvenir Shop are open to visitors 10am to 5pm daily throughout the week. Hastings History House, 21 Courthouse Street , Old Town . Talk by Dr. Ke Xia Xu with a questions and answer session. Find out all about Chinese Medicine & Remedies. Talk lasts 60 mins. Free Entry. A practical illustrated talk by Nigel Bassett D.O. GOsC Reg. £1 entry, light refreshments available. Derek will be signing his book 'Drawn to Hastings '. Entry (including Coffee & Refreshments) £1.50. 1.10pm to 1.50pm Free admission. The Golden Age of English song. Two sections this year, one for sight impaired and one for sighted. Open to everyone, theme is 'My Favourite Day'. Organised by Hastings & Rother Voluntary Association for the Blind. Ballroom, Popular Sequence, Latin American Dancing to modern and 30s/40s music. £3 Entrance to include refreshments. Presented by Friends of White Rock Theatre and hosted by MC Ian Marshall 'Marsh The Man'. Meet at top station of West Hill Lift. Martial arts demonstration by the Westerleigh Judokwai Club. The Azur bistro will be open for snacks and drinks. Organised by High Street Traders. Barbeque and other hot food, Lindy Hoppers, Live Bands, Street Market, Sideshows, Street Entertainment and much, much more. Free entry. All are welcome. Venue M, George Street, Hastings Old Town. With members works on display and membership details available. Contact: Dennis Philpott, 01424 715837. Stalls selling Homemade Preserves, Cakes and Flowers. Early arrival recommended as they sell out very quickly. Illustrated Talk by Ken Brooks - The transition from a poor fishing village to a popular holiday resort. A nostalgic look at the seaside attractions of Victorian Hastings. £2 admission with wine and light refreshments. The Savannah Jazz Band from Yorkshire . Their style is reminiscent of an approach to the best of the late Ken Colyer. A fine traditional jazz band with a driving, foot-tapping,bouncing rhythm. An evening not to be missed. Also rehang of the permanent collection of Paintings of Local Interiors. Exhibition continues until 4th January, Monday to Saturday 10am to 5pm, Sunday 11am to 4pm. Admission Free. Quality craft exhibition with all manner of fabulous items on display and for sale. Opening by Michael Foster DLMP at 10am. Free entrance. Call Lynn Page on 01424 721791. A fascinating 'war time' guided walk of approx 1 hour, taking in most of the Hastings TV film locations used for this popular TV series. Conducted by Clive Richardson, British Tourist Authority Blue Badge Guide. £4.50 adults, £2.75 under 14s on the night or discounted in advance from Shipwreck & Coastal Heritage Centre. 01424 775534. Celebrate diversity with performance and workshops with Hastings young peoples' groups. Part of multi-cultural week. With live band performances after the fireworks. Entry by donation. Teams from Dordrecht, Sevenoaks, Brighton and Haywards Heath play against local Hastings team. Only the intrepid will want to join this macabre meander through the lamplit streets of this historic town. Admission £5.50 (adults), £4.00 (under 16s) payable on evening. Duration: 1hr, 30 mins. Participants with dogs on leads welcome. Hastings Runners carry flaming torches from the East Hill beacon to start the procession. A spectacular traditional Sussex Bonfire procession with representatives of Bonfire Societies from across Sussex marking the anniversary of the discovery and foiling of the Gunpowder Plot in 1605. Commences from The Stade, up All Saints Street and down the High Street to the promenade, turning right at Albert Road, into Queens Road turning at the junction of South Terrace back to the Town Hall to be joined by the Mayor, other officials and Town Criers. At the Town Hall the Town Crier reads the declaration of the America Ground, the procession continues cross the America Ground to the promenade and finishes at Pelham Place car park. Pre event entertainment provided by Arrow FM. Bonfire on the beach with our famous effigy. One of the UK's largest, loudest and most extraordinary firework displays and one of the UK's largest Bonfires. Safety Notice: Please respect the safety barriers and do not pick up discarded torches or bring your own fireworks. Keep your children with you at all times and ear protection is recommended if you or your children are frightened of loud bangs. Please do not bring pets and dispose of all litter correctly. until 11:00pm Road closures around the Old and New Towns. 9.30pm (or later depending on the bonfire) the Firework display starts. Admission £5. With top local musicians and winners of Hastings HAS Talent. Tickets and further information please call 01424 436333. Services, veterans and cadets will assemble while ?? choir perform. A vote of thanks will be given by the Mayor. The Town Crier will give a closing address. An atmospheric and entertaining guided walk of approx 1hr 20mins around the Old Town and fishing quarter, recounting true stories of smuggling in Hastings in the 18th and early 19th centuries and the involvement of local people. Conducted by Clive Richardson, British Tourist Authority Blue Badge Guide. Tickets in advance £4 adults, children £2.50 under 14, from Shipwreck Heritage Centre, Rock a Nore or from guide on the walk at £4.50 adults, £3 children under 14. Donation to Shipwreck & Coastal Heritage Centre and OHPS. Spine Chilling close encounters of the supernatural kind vividly described with thought-provoking insights of the elusive spirit world. Admission: £5.50 (adults), £4.00 (under age 16), payable on the evening. Duration 90 minutes. Participants with dogs on leads welcome.